Newcomer Family Obituaries - John Monahan 1945 - 2015 - Newcomer Cremations, Funerals & Receptions. John Edward Monahan, age 70 of Dayton, passed away July 30, 2015. He was born February 16, 1945 in Chicago, IL to the late John E. and Virginia Monahan. John is survived by his loving wife of nearly 18 years, Janet Monahan; children: Julie Linder, Katie Erbaugh, Meghan (Scott) Morgan, John Monahan and William Pittl; grandchildren: Kyle, Kelly, Hayley, Alyssa, Max, Jonah, Leo and Billy; sisters: Margaret "Peg" Monahan and Eileen Martorano; many nieces, nephews and friends. 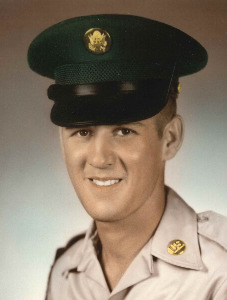 John was a graduate of the Roosevelt Military Academy. He was a proud member of the U.S. Army. John was a Sharpshooter and was awarded the National Defense Service Medal. Before his retirement, John was an employee of the Voss Auto Network. John was of Irish decent and was blessed with the gift of gab. He was loved and will be sorely missed by all who knew him. Visitation will be held from 5-8 pm on Wednesday, August 5, 2015 at Newcomer Funeral Home, 3940 Kettering Blvd., where the funeral service will be held at 1:00 pm on Thursday. Burial and military honors to follow at Dayton National Cemetery. Add your memories to the guest book of John Monahan. I miss you my sweet brother! John I miss you so.Christmas was so lonely without you.I will never be the same.Sometimes my heart aches so bad I can hardly breathe.I can't understand why you had to leave us.We miss you so very much.There is not a day that goes by that I don't think of you.sometimes when I close my eyes I can see you walking in the door.I would give almost anything to have just one more day with you.You are forever in my heart. I love you and always will. My darling John I miss you more than words can say.Not one day goes by that I don't think of you.My heart has a terrible hurt that I will care with me the rest of my live.You were taken so quickly,we didn't have the chance to say goodbye and to tell you how much we loved you. I would give almost anything to have just one more day with you.Sometimes its so hard to keep going on thats when I think of you and the time we had together.I will love you and miss you till God takes me home. Growing up, life with my dad wasn't always easy, but I know that I am the woman I am today because of my experiences with him. My dad liked to give me a lot of "feedback" on my decisions; as a child and young adult, they could at times feel critical. I later realized that this was out of love- he saw the full potential in me and wanted me to live up that that. When my friend asked me what God would say about my dad, I answered without hesitation that God would say he created my dad to be his family's #1 fan. He would brag on us to ANYONE who would listen. I'm sure the people at Tim Hortons even know all about his precious grandchildren. Looking back on my dad's life, I can see God's story written all through it, but my favorite part is without a doubt this last chapter. My dad loved deeply and intentionally. It's been said that as adults, we can see the love of our parents have for us when we see how they love our children. That couldn't have been more true for my dad. His love for his grandchildren was unconditional and perfect. The world could literally crumble around him while his eyes were fixed on my boys. He loved to hear about or do whatever they loved- Star Wars light saber battles, baseball, Mario, whatever it was. It was all the most important thing in his world at that moment. He never saw the naughty side of them. They were perfect in his eyes. This love and grace my dad displayed will carry me moving forward as we grieve our #1 fan. Dad, I'll miss your phone calls, telling me how Scott is your favorite son in law (he's his only one), your infamous "hey, I wanted to ask you something..." and "one more thing and I'll let you go"..said at least 10 times before we ended each call. Even though I lost my dad much too early, I will forever be thankful that he was here to celebrate my graduations, walk me down the aisle on my wedding day and most especially, to meet my three boys. Dad, I promise I'll feed my boys well, I promise to tell them how you wouldn't dream of spoiling them and I promise to let them know that you will remain their number 1 fan and that you'll always have the best seat for every game, concert and recital. I love you, dad. Say hi to gram and Grandpa for me please. We are so sorry for you and your family's loss. We are thinking of you and keeping you in our prayers! I was blessed to have worked with John at Voss some time back and more recently, my husband got to share the blessings of spending time with John there before his retirement. My husband enjoyed telling me his day with John, the many things about John that impressed him so, especially his military service and his pride in that. They shared moments that will always mean a lot to my husband and your John will certainly be missed. Our prayers have been with you and will continue to be. I am so sorry for your/our loss of John. He was always smiling and there to help with a story. My husband Terry and John loved the Chicago Cubs and would sit for hours talking about them and all sports. I am proud to call him my brother in law and proud of him for serving our great country. God Bless you Sarge, I am going to miss you. My Grandpa John was a great man and served his country with great pride and honor. I will always remember one time when I started watching his favorite TV shows with him called Judge Judy and MASH and ever since then I have been hooked on the two shows. He was a great man and I will miss him. John was a great man, with a GAINT Heart, he loved all of his family and his country, he was a proud veteran and I am proud for his service. He never said to people this is my step son , he would say this is my son William and my grandson little William when my son little Bill would be with us , he never said to my mom these are your kids and these are my kids he would these are our kids.He loved my mother very much and took great care of her and us . I and my family are better for having him in our lives for 18 years . We shared a love of the Chicago Bears and Cubs, NOTRE DAME Fighting Irish. He lover to watch little Bill play soccer and me coaching him, especially against my good friend and brother Chad Folck who he lover he and his family dearly. He was not my step dad he was my dad. I love you and miss you. I am so saddened at John's passing. I pray your heart's are comforted daily. I am so proud to say John was part of our family as well. I will always think of John as a proud Army Soldier. He is certainly going to be missed. Janet: I am so very sorry for the passing of John. He was truly a one of a kind. I will always think of three things when I remember John. His little habit of always saying "an that" when he was telling something. His absolute gift of gab, and his pride in the American flag. Home of the free because of the brave. Love you sister. Carry on John's spirit of strength and pride.